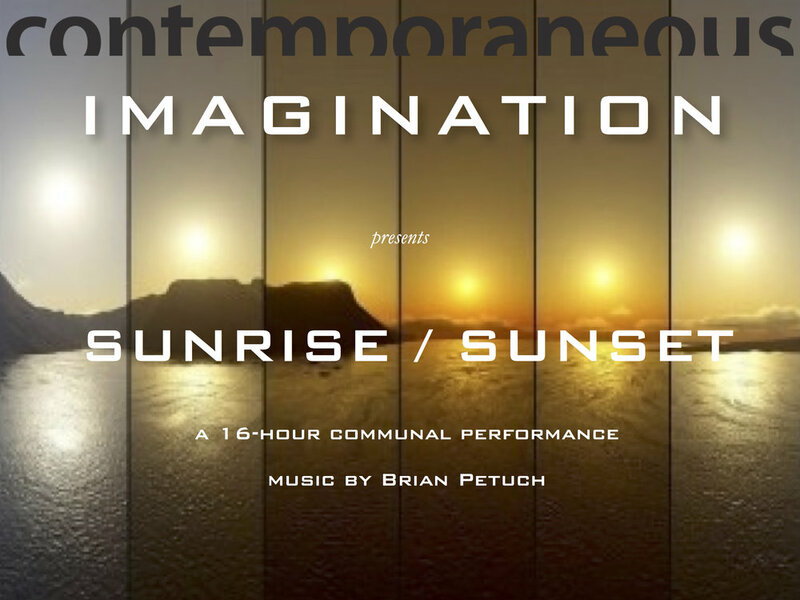 Contemporaneous IMAGINATION presents SUNRISE / SUNSET by composer Brian Petuch, a 16-hour communal performance that tracks the movement of the sun from sunrise to sunset on the longest day of the year, the summer solstice. Like the day itself, SUNRISE / SUNSET begins with primordial hush, intensifies to a brilliant climax at midday (1:00 pm), and fades away with a "green flash" summation of the day just after sunset (8:45-9:00 pm). Listeners are invited to come by at any point during the day to enjoy this beautiful meditation on the passage of time and our place beneath the sun. Additionally, SUNRISE / SUNSET acts a a sonic space in which the audience can engage with the music either as a listener or as a performer. All level of musicians are invited to join for as long as they'd like! To sign up to play or sing along in this communal musical gathering, please fill out our registration form here. The performance will take place on the World Trade Center's new Liberty Park, overlooking the September 11 Memorial, and will be a part of Make Music New York, the annual citywide solstice celebration. Contemporaneous IMAGINATION is a new initiative which seeks to foster a culture of radical creative openness for composers and musical artists. Contemporaneous IMAGINATION is an open call that asks composers to share their wildest creative dreams, and then commissions, develops, produces, and presents the most meaningful of these works, with a commitment to select projects entirely based on their artistic merit and the effect they will have on the community, without regard for conventional restraints that often discourage the creation of work of such imagination and scale.